I'm having ambivalent feelings about this movie for two reason: I loved the gore and quite a few details in the movie but I hated the way they changed a lot of things from the original Manga. 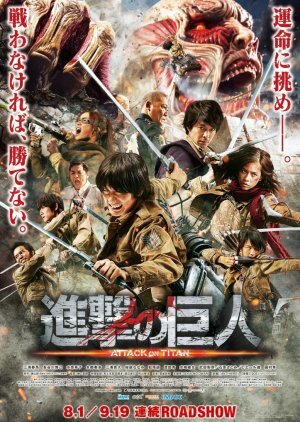 As a fan of the manga/anime, I was definitely disappointed on how things turned out for the story line in this live action movie. I would have understood if there were minor changes since there is so much a movie can take from a long manga series, however it wasn't just that - there was a major character deviation as well which was a huge blow for me. I was really looking forward to see the live adaptation of Mikasa, Armis and Eren as how they were supposed to be and was pretty excited on how the actors are going to portray each character accordingly, but unfortunately this isn't the case. The only perfectly retained character was Zoe Hange; her character as the crazy soldier scientist was definitely the same as the original. The overall CG effect was something not even worth talking about, the only highlight about it was the way they made the live titans. They were freakishly big, dumb and gruesome… which I LIKED! I also gave a small clap on how the titan Eren turned out. It was almost-almost the same as the Anime/Manga version. Music wise, I’d have to say so-so for the entire duration of the film, up until the ending. Since the song for the credits was a bit more memorable than the rest. It was noisy and rock which was the perfect ending song for a supposedly gruesome movie. Overall the movie was okay but not okay. If you’re a fan of the manga/anime, you would probably love-hate the movie just like me. There were a lot of key points to like and a lot more to hate. How I wish they just made a drama series out of this, it might have given more justice to the whole live action thing. Setting all of this thoughts aside, I would still watch the sequel so just to say I have finished the movie and didn’t give up on it.